If you've never heard of Wallace you are missing out on an amazing story of courage, love, determination, and never-give-up-ness. If you have heard of Wallace you share in the joy that is dog, through and through. We were incredibly fortunate enough to get a free advance copy of the new book about Wallace from the publishers to review a few weeks ago. Written by Jim Gorant, a Sport Illustrated senior editor and also author of the wonderful book The Lost Dogs, the story of the Michael Vick dogs, Wallace: The Underdog Who Conquered a Sport, Saved a Marriage, and Championed Pit Bulls--One Flying Disc at a Time is a great read about the life and rise of Wallace, a celebrated champion of disk dog and poster boy for how amazing pit bulls really are if only given a chance. 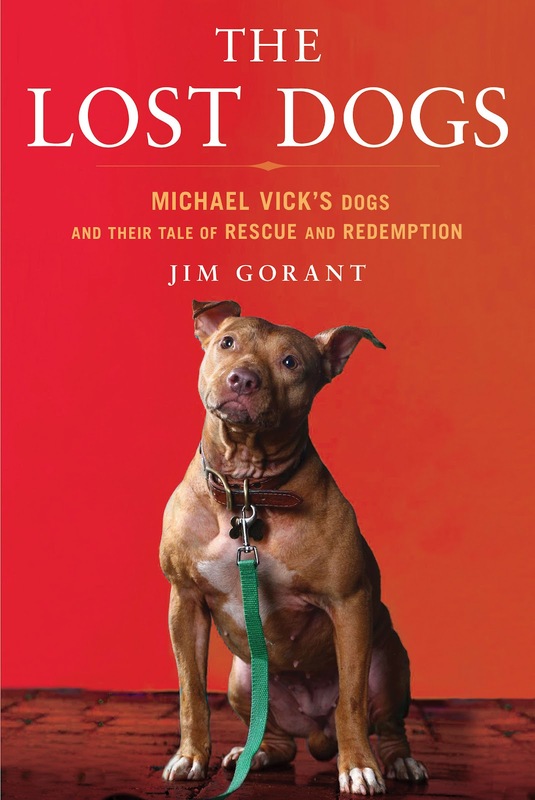 The story starts with an introduction of Wallace, most probably from a litter of potential dog fighting dogs, yet rescued by a well meaning and caring individual who was at a loss to handle Wallace's extreme energy. Surrendered to a shelter, Wallace had the potential of becoming a euthanasia victim because of his extreme intensity and energy. He was not doing well in a shelter environment. Thankfully he was championed, saved and fostered by a young couple, Roo and Clara Yori, that understood Wallace, and that he only needed a job to live up to his full potential of being a great dog. They worked with him with weight pulling, eventually finding disc dog as his favorite 'job' of choice. And Wallace, in true determination, joy and energy took them all the way to become the USDAA Cynosport Games World Champion in 2006. 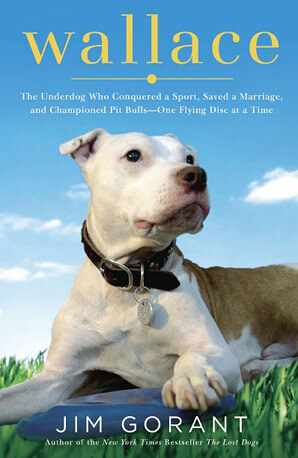 Wallace's story starts out very typical of misunderstood breeds, but leads to an amazing story of the making of a champion, bringing with it a new understanding by many of just what pit bulls can be - loving, athletic, amazing, cherished, caring breeds that can change your life, and become underdog to wonderdog. After knowing about Wallace for years, we really enjoyed reading about where Wallace came from and all it took for him to reach Champion status. Written in reporter style, the book is a factual, thoughtful account of just how a dog can change lives and change minds. 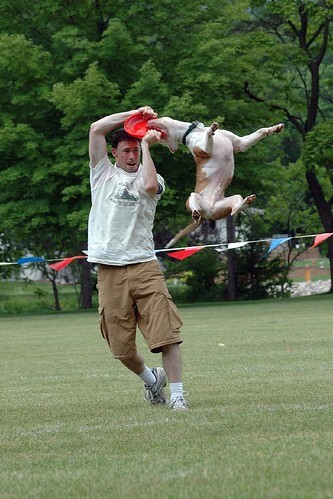 At disc dog competitions back in the mid 2000's, Wallace was something to see. 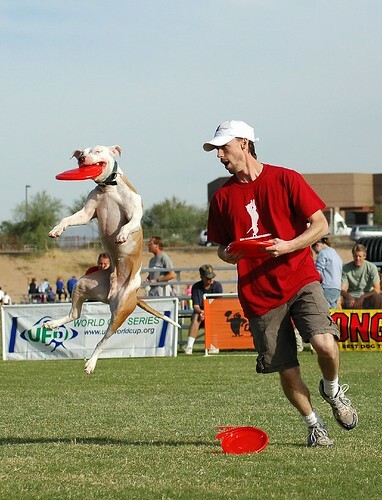 Such an unlikely disc dog, yet combined with Roo's athleticism, they woo'd crowds and brought on cheers, oooooo's and ahhhhh's. Watch Wallace do his thing! And don't miss Wallace play disc from Roo's perspective. Get Wallace, the book in Hardback, Kindle Edition, and Audio Book. And here's good news!!! You have a chance to win both Wallace and The Lost Dogs books! All you need to do is leave a comment on our blog (US only please) and we will draw randomly from those who comment through random.org. Please check back on this blog or on our Facebook page to find out if you won (we'll need to get in contact with you via email for further info)! Deadline is September 24, 2012. Note from Johann: Just this past week Wallace and his family suffered some devastating news. He has been diagnosed with hemangiosarcoma, a rapidly growing, highly invasive variety of cancer. If you would like to help Wallace, his family has posted ways you can on his Facebook page. Our hearts and love go out to Wallace, Roo, Clara and his fellow two and four legged friends and family. Wallace reminds us of our friend Rose who was rescued from a Walmart parking lot. What a great story! I'd love to read more about Wallace :) I just love bully breeds! I've heard a lot about Lost Dogs and would love to get a chance to read both books. I always feel a little punch in the stomach when yet another dog has hemangiosarcoma. So many of them--dogs I know and dogs I don't--and so far there's no known cause, no known cure, and nothing really to do but treat the symptoms as best as possible and love your dog, if you even have the chance to do that. Thanks for the follow-up note about that. We have a winner!!!! Elf/Ellen was drawn randomly as the winner of the two pawsome books by Jim Gorant! Thank you all for entering!